A brightly colored grain elevator and three large cylinders located in the small town of Coronach in Southern Saskatchewan, Canada. The grain elevator in the town of Coronach, Southern Saskatchewan in Canada is one of the main sources of income for the people in this region. The large grain elevator and the modernized cylinders makes the process increasingly faster, bringing in more business for this town. Not far from the US border, the town of Coronach, founded in 1926 by the Canadian Pacific Railway, had a population of about 300, but is now home to about 950 people. With the success of the Poplar River Power Plant and Coal Mine and the agricultural industry, the town of Coronach has tripled in size. Saskatchewan, Canada is one of the major producers of grain and the faster the process is completed, the better for the entire region. Coronach is a quaint place to visit while in Southern Saskatchewan, Canada with the grain elevator being a prominent feature in this town. There are also restaurants, accommodations, campsites, horse racing, golf and bowling to keep tourists intrigued while visiting Coronach. 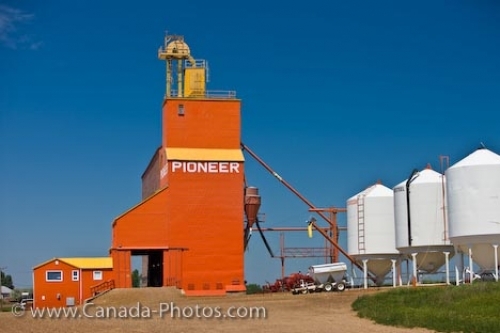 Picture of the bright orange grain elevator in the town of Coronach in Southern Saskatchewan, Canada. Grain elevator in the town of Coronach, Southern Saskatchewan, Canada.